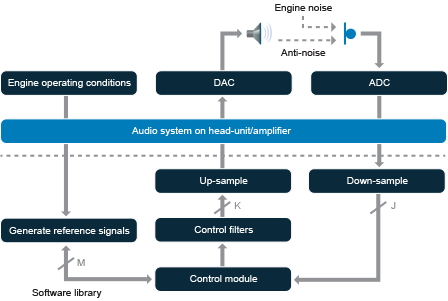 QNX Acoustics for Active Noise Control (ANC) provides a high-performance software solution for engine harmonic noise reduction in passenger vehicles. By allowing automotive system designers to leverage existing audio and infotainment hardware, the ANC library provides dramatic savings over existing hardware ANC solutions – while simultaneously increasing performance by up to 50% and providing enhanced design flexibility. QNX Acoustics for Active Noise Control integrates seamlessly into a vehicle's infotainment system. Delivered as an optimized binary ported to a specific hardware and software configuration (with or without an operating system), QNX Acoustics for Active Noise Control can perform up to 50% better than existing hardware solutions found in many passenger vehicles. QNX Acoustics for Active Noise Control provides up to 20 dB noise power reduction depending on transducer and vehicle seating configuration. Noise reduction measured at front and rear positions in minivan driving at steady state speed of 65 mph. When enabled, QNX ANC technology delivers up to 11 dB noise reduction at 48Hz. QNX Acoustics for Active Noise Control eliminates the costs associated with designing and prototyping a custom hardware controller module. Developers can easily integrate the library into a vehicle's head unit, power amplifier, using a dedicated DSP or application processor. Using the comprehensive API, they can quickly build high performance, robust systems that significantly reduce or remove undesirable engine noise. The ANC solution can generate significant bill of materials cost savings for automakers. Using QNX Acoustics for Active Noise Control fast-tracks development by eliminating the need for custom hardware builds and by reducing tuning efforts – often from months to weeks. Various types of drive-train technologies, such as variable cylinder management and lower RPM torque, help improve fuel efficiency but come at the cost of increased cabin noise. QNX Acoustics for Active Noise Control reduces engine harmonics below 150 Hz using vehicle RPM data from the CAN bus and audio data from cabin microphones. The library generates anti-noise signals (equal in magnitude and opposite in phase to the primary noise) and emits the signals from the vehicle’s loudspeakers, cancelling unwanted engine noise. When integrated into a vehicle audio system, ANC eliminates the need for dedicated hardware. Solutions that separate ANC and audio processing by putting them on different hardware are generally difficult to manage. QNX Acoustics for Active Noise Control eliminates this problem by integrating ANC functionality with other audio processing tasks on an existing DSP or processor. It runs seamlessly alongside other audio-processing systems (hands-free, voice recognition, audio playback, etc) and allows a single application to control the complete audio processing chain. In-cabin audio can vary depending on the number of passengers and contents in the vehicle, seat positions, aging of audio components, temperature, window position, and so on. Systems designed with QNX Acoustics for Active Noise Control can readily cope with dynamically changing audio within a vehicle. With QNX Acoustics for Active Noise Control, automakers can choose to implement a “one calibration fits all vehicles” methodology whereby, in a production line, the pre-calibrated data is loaded into each vehicle’s flash memory and used as required. Alternately, calibration may be performed for each and every vehicle in the production line following a “one calibration per vehicle” strategy. QNX Acoustics for Active Noise Control is supported on both floating-point and fixed-point DSPs and application processors with or without operating systems. Contact us for information on supported platforms or how to port the ANC library to your hardware. 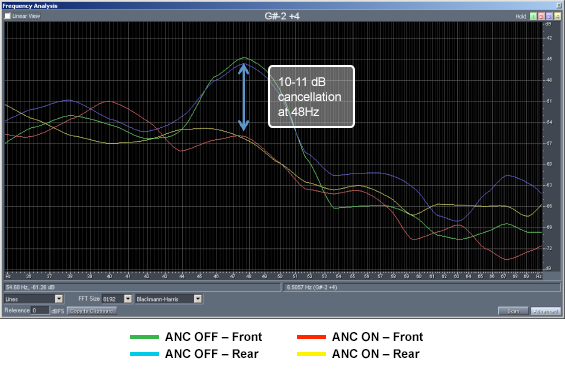 Computational resources required for QNX Acoustics for Active Noise Control are low. For example, a three-microphone and three-control output configuration running on an ARM Cortex A8 processor (in fixed point mode) uses less than 25 kB RAM and 22 MHz CPU load while processing 1 engine order. Full benchmarking data is available upon request. 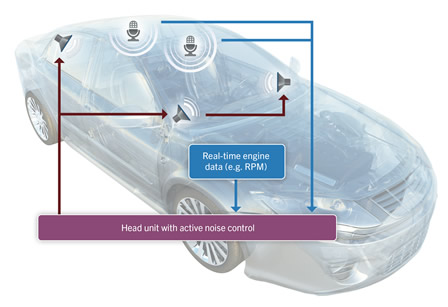 QNX Acoustics for Active Noise Control supports 8 kHz and 48 kHz sampling of audio input and output signals.